Draft: 2008, St. Louis Cardinals, 1st rd. 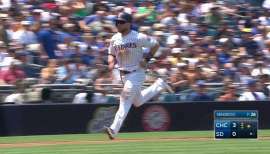 With Brett Wallace batting, Derek Norris steals (6) 2nd base. January 4, 2017 1B Brett Wallace assigned to El Paso Chihuahuas. December 19, 2016 San Diego Padres signed free agent 1B Brett Wallace to a minor league contract and invited him to spring training. November 18, 2016 3B Brett Wallace elected free agency. November 18, 2016 San Diego Padres sent 3B Brett Wallace outright to El Paso Chihuahuas. 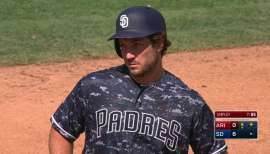 July 21, 2016 San Diego Padres activated 3B Brett Wallace from the paternity list. 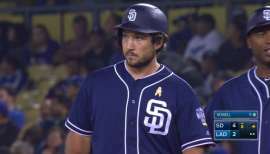 July 18, 2016 San Diego Padres placed 3B Brett Wallace on the paternity list. June 19, 2015 San Diego Padres selected the contract of 3B Brett Wallace from El Paso Chihuahuas. December 30, 2014 1B Brett Wallace assigned to El Paso Chihuahuas. December 15, 2014 San Diego Padres signed free agent 1B Brett Wallace to a minor league contract and invited him to spring training. July 18, 2014 Buffalo Bisons activated 1B Brett Wallace. July 14, 2014 Baltimore Orioles traded 1B Brett Wallace to Toronto Blue Jays for cash. July 14, 2014 1B Brett Wallace assigned to Buffalo Bisons. March 28, 2014 1B Brett Wallace assigned to Norfolk Tides. March 23, 2014 Baltimore Orioles signed free agent 1B Brett Wallace to a minor league contract. March 12, 2014 Houston Astros released 1B Brett Wallace. February 28, 2014 1B Brett Wallace assigned to Houston Astros. February 12, 2014 Houston Astros sent 1B Brett Wallace outright to Oklahoma City RedHawks. 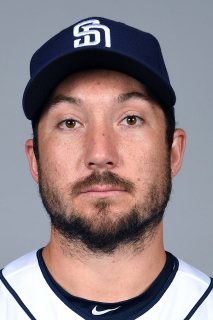 February 6, 2014 Houston Astros designated Brett Wallace for assignment. June 25, 2013 Houston Astros recalled 1B Brett Wallace from Oklahoma City RedHawks. April 18, 2013 Houston Astros optioned Brett Wallace to Oklahoma City RedHawks. July 30, 2012 Houston Astros recalled Brett Wallace from Oklahoma City RedHawks. June 17, 2012 Houston Astros optioned Brett Wallace to Oklahoma City RedHawks. June 3, 2012 Houston Astros recalled Brett Wallace from Oklahoma City RedHawks. April 1, 2012 Houston Astros optioned Brett Wallace to Oklahoma City RedHawks. October 14, 2011 1B Brett Wallace assigned to Leones del Escogido. September 2, 2011 Houston Astros recalled Brett Wallace from Oklahoma City RedHawks. August 1, 2011 Houston Astros optioned Brett Wallace to Oklahoma City RedHawks. July 31, 2010 Houston Astros selected the contract of Brett Wallace from Round Rock Express. January 13, 2010 Toronto Blue Jays invited non-roster 3B Brett Wallace to spring training. December 16, 2009 Sacramento River Cats Traded 1B Brett Wallace to Las Vegas 51s and New Hampshire Fisher Cats Traded LF Michael Taylor to Midland RockHounds. December 14, 2009 Brett Wallace assigned to Oakland Athletics. July 24, 2009 Memphis Redbirds traded 3B Brett Wallace to Sacramento River Cats. May 16, 2009 Brett Wallace assigned to Memphis Redbirds from Springfield Cardinals.